Shapoorji Pallonji Group which has management control in the Gopalpur port off the coast of south Odisha, has pledged to invest Rs 3000 crore more on the port's expansion. Backed by the additional investment, the port’s capacity will be ultimately ramped up to 55 million tonnes by 2025. The port was dedicated to the nation by chief minister Naveen Patnaik Thursday. Shapoorji Pallonji Port Maintenance Ltd, a group company, took over the management of the Gopalpur port in 2017. After taking over the management, the expansion of port infrastructure was initiated to enhance the port capacity from 2.5 million tonnes to 20 million tonnes entailing investment of Rs 2000 crore of which expenditure of Rs 1400 crore has already been incurred. “Further plans are underway to enhance the capacity to 55 million tonnes by 2025 with an additional investment of approximately Rs 3000 crore. The port shall generate direct and indirect employment opportunity to the tune of 6500 people”, an official statement noted. With the completion of an ongoing expansion, the berth length has been increased to 800 meters which was 225 meters at the time of commissioning. Similarly, the depth has now been enhanced to 15 meters and a stock yard of 66000 square meters have been developed. Three harbor mobile cranes are also installed for handling gearless vessels and enhancing loading and unloading capacity. “Apart from the major infrastructure developed, other allied infrastructure like internal road, boundary wall, power supply, security arrangements and development of railways infrastructure are also under progress”, the statement added. 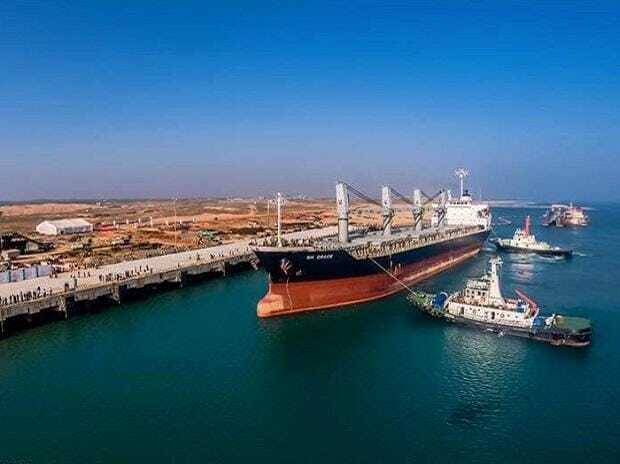 Gopalpur port which was operating as a fair weather anchorage port since 1986 was handed to Gopalpur Ports Ltd in 2006 through international competitive bidding to construct an all-weather deep water direct berthing port. The project after obtaining environmental clearance in March 2011, was commissioned for commercial operation during March 2013. The port's operations were also battered by two successive tropical cyclones- Phailin and Hud Hud in 2013 and 2014, respectively. Subsequent to reconstruction and rehabilitation, the port was recommissioned during October 2016.